The Washington National Primate Research Center was tapped to serve as the coordinating center to oversee the combined pledge of funds from the NPRCs in California, Georgia, Louisiana, Texas, Washington and Wisconsin totaling $30,000. 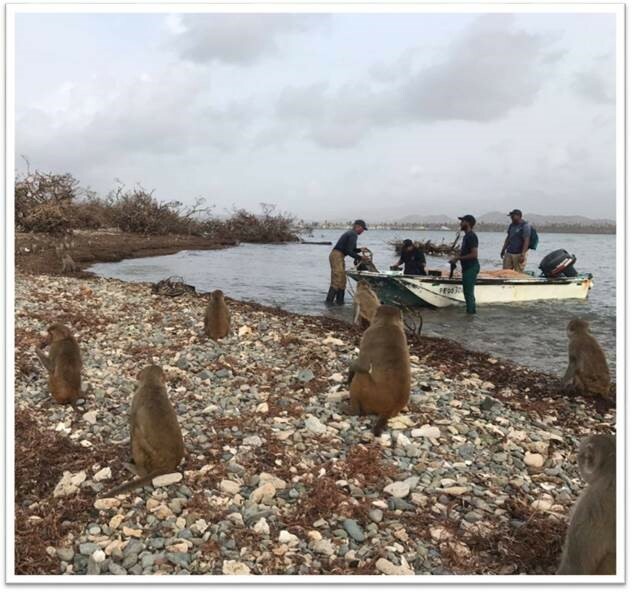 The Cayo Santiago Field Station was heavily damaged by Hurricane Maria, which destroyed the buildings, feeding corrals, and all but one of the water cisterns necessary to support a free-ranging population of monkeys. This aid will arrive in Puerto Rico by way of a container ship with vital supplies and equipment. The NIH is facilitating these operations, and FEMA is prioritizing urgent animal support supplies in order to avoid some of the supply chain backups that have plagued ground distribution in the aftermath of Hurricane Maria. Noah Snyder-Mackler, assistant professor of psychology here at UW, is providing leadership to a diverse group of stakeholders including coordinating efforts with the NPRC consortium, the non-profit “Better Research, Better Life Foundation” (BRBLF), and investigators from New York University, University of Pennsylvania and the University of Exeter in England. Two GoFundMe sites have been set up in conjunction with these operations: Cayo Santiago Monkeys: Maria Relief and Relief for Cayo Santiago Employees. An update from the latter page reads: “One NY-based colleague who will be flying to Puerto Rico on Tuesday with supplies for Cayo Santiago facilities (tools and a satellite phone that will greatly improve our ability to communicate with those in Punta Santiago) is also bringing some much needed relief for Cayo Santiago employees, including solar-powered USB chargers, solar flashlights, crank radios, batteries, water filtration systems, and formula and powdered milk for staff with young children.” This page has raised over $50,000 in donations to this point. New York University assistant professor of biological anthropology James Higham discussed the hurricane’s impact and the relief efforts of academic institutions already underway.